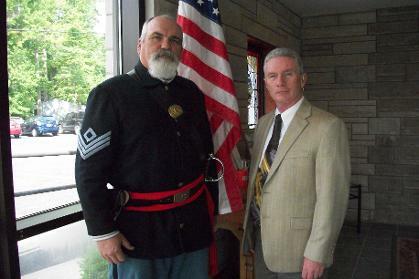 Mike, Terry, and Marvin serve with the VFW Honor Guard at SCE. The JCHS Color Guard and Seth Jones prepare for their parts in the program at Hayden Elementary. 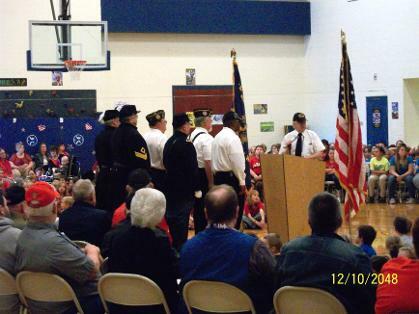 Mike and Terry sit with VFW Post 2021 and veterans to enjoy the Hayden Elementary program. Mike swaps stories with the 7th IN guys. Terry & Mike brace the cold before the memorial begins. 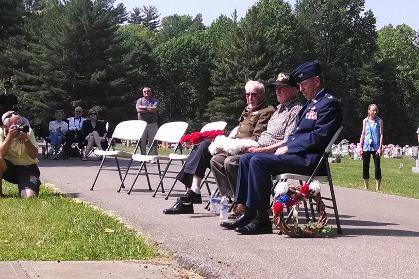 Veterans fold flag for the memorial service. Justin and Terry talk to Ms. Evans's US History class. Justin and Terry talk to Mr. Hartwell's US History class. Greys camp at the Thiebaud House. Justin and Terry pose in camp. Terry and Justin fire a round for the noon hour. 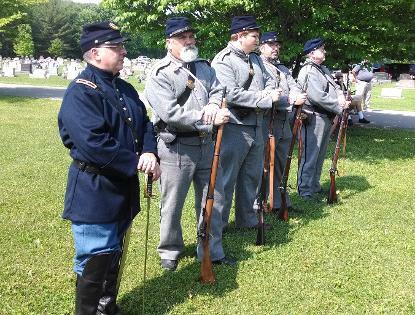 What a Union soldier carried and used display. 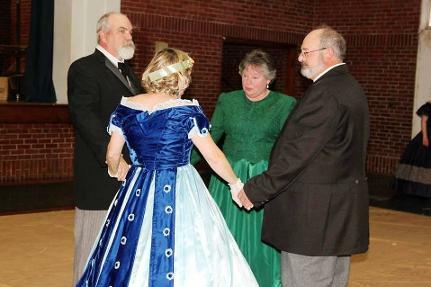 A demonstration of an 1860s wedding is performed. Mike and Justin show reverence during wedding. Justin and Rick await the onslaught of visitors. 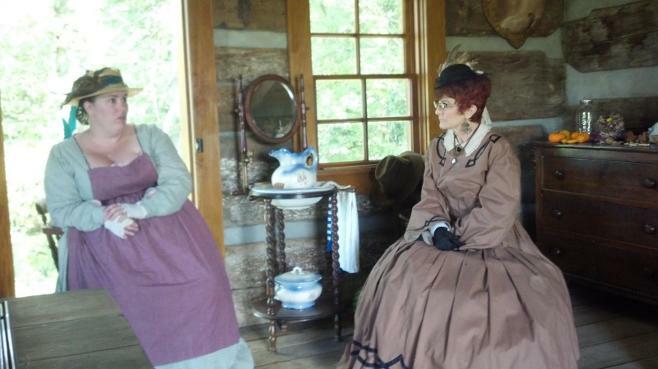 Sheila sits at her table for her Genealogy and Jen. Co. Library. 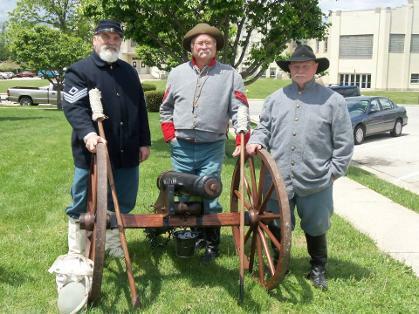 Terry, Rick, and Justin prepare to fire a noon volley. 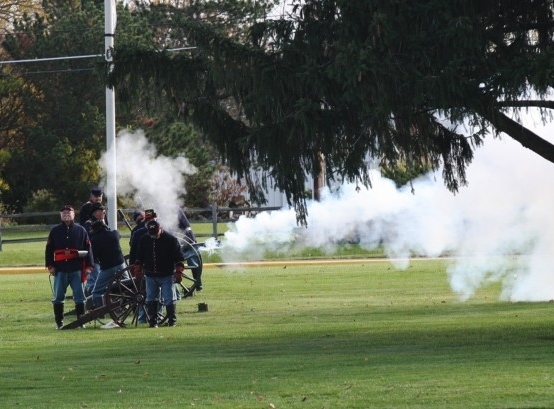 The Greys fire a volley to mark the noon hour. Soldiers catch up with each other before presentation. 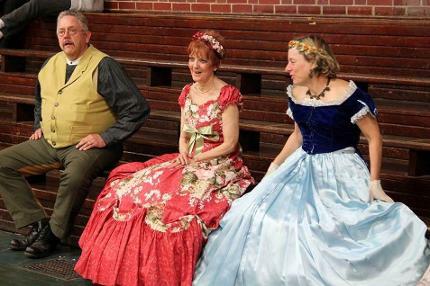 The audience begins to arrive. While 7th IN artillery loads, soldiers prepare to fire. Group shot of soldiers involved. Mike talks with 7th IN before parade. 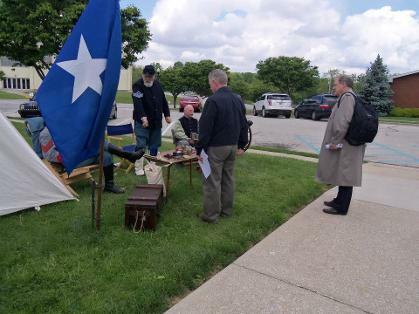 Greys flag hangs on back of cannon trailer. And then the rains began. 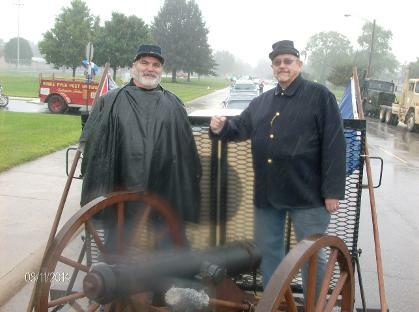 Rain-drenched Civil War soldiers ride in parade. Greys fly & Union on left side of camp. 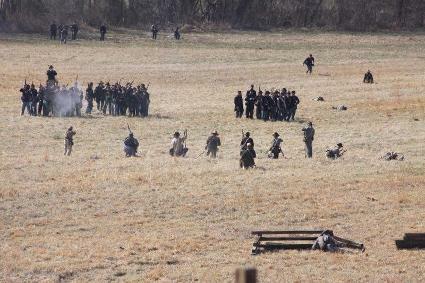 Nelson's Artillery & Confederates on right side of camp. Rick waits for the curious visitors. Terry and Rick pose next to the fly. CW camp at Tunnel Mill (Terry's tent on left). Justin serves as sentry on the road. 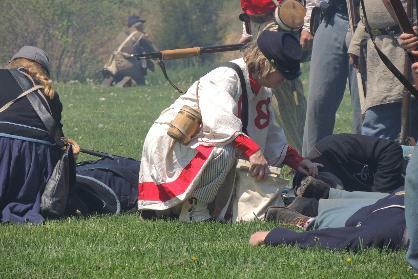 Terry with other Union soldiers try to protect the John Work house. Terry & Justin rest in shade. Terry, Justin, & Bill prepare to take the field. 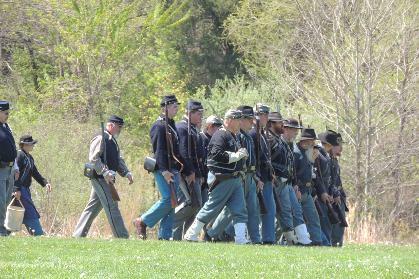 Union forces at the start of Saturday battle. 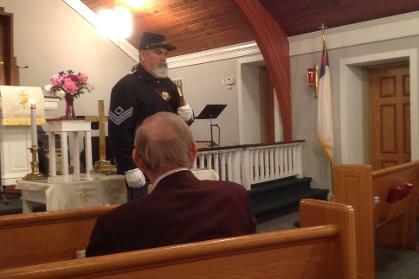 The Kentucky Home Guard Band entertains. 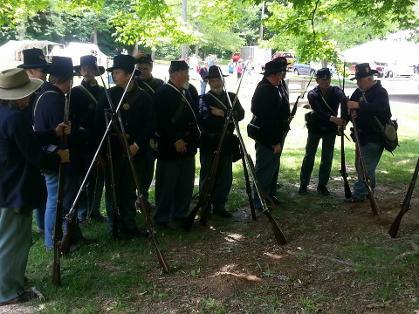 Bill & Terry with Union forces Sunday. Terry, Marvin, Rick, Justin, & Mike try to stay cool. 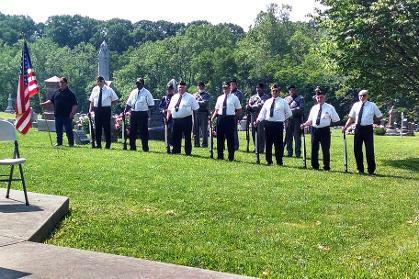 Greys fall in behind VFW honor guard. Greys behind veteran honor guard. 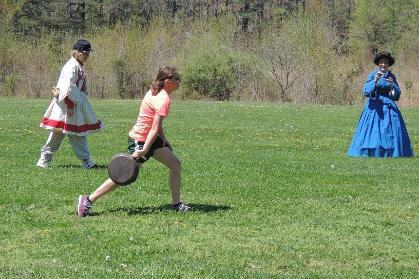 Terry and Justin drill with Union troops. 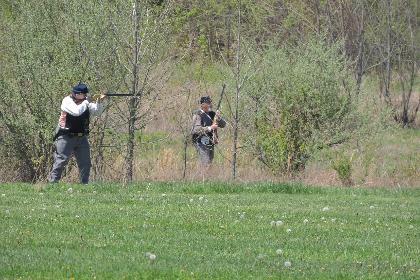 Bill and Mike skirmish the Rebs. Justin, Terry, & Mike help form a last stand. Mike battles a Reb hiding with the crowd. Literature display in front of the tent and 'what they carried" beside. Jim Terry and Ernie Holt talk to visitors. Terry poses with a pair of youngsters. Terry's "what they carried" display. 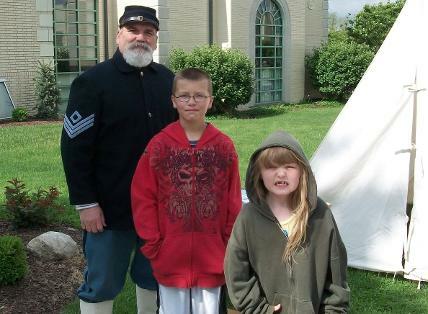 Greys camp using Historical Society tent. Nancy, Jan, Connie, Mike, & Robert (L-R) talk with visitors. Mike with Underground Railroad trap door in John Roche Law Office. 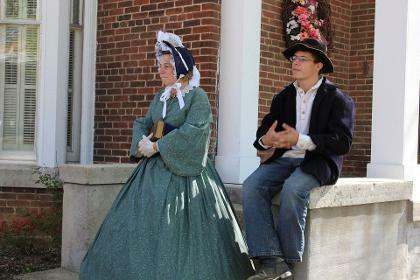 Jan and Robert listen to Mike on the Underground Railroad Tour. Post-battle comments by the Union commanders. 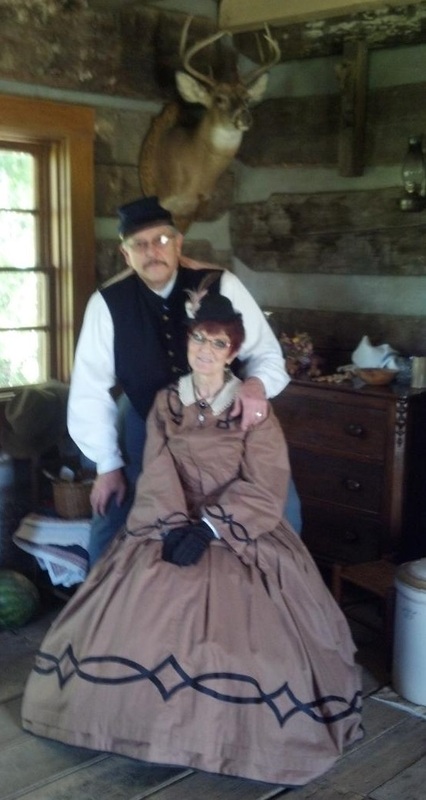 Part of the Confederate camp (some in winter quarters). 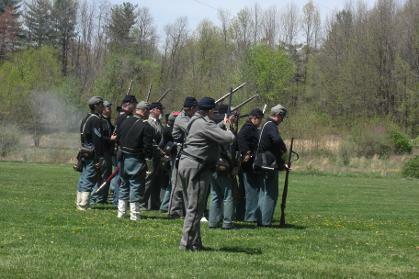 A section of the Union camp before the battle begins. 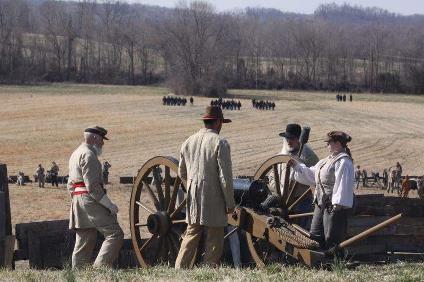 General Grant (Curt Fields) and his staff survey the action in front of them on the battlefield. 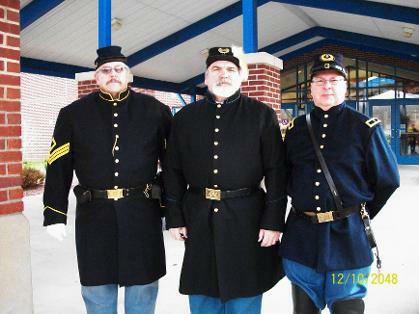 Terry , Roger Tenney (General Smith), Curt Fields (General Grant), Michael Trapossa (Col. Rawlins) and Greg Wernke pose.